Sands2 sandwich bar in Bournemouth has become synonymous with great food and fantastic value for money, coupled with efficient and friendly service. Located near the busy Lansdowne roundabout, you will find a large variety of sandwich fillings, an extensive selection of breads as well as alternatives such as salad boxes, jacket potatoes, hot grilled paninis and wraps. We stock Gluten free bread and cater for vegans too. Our service is totally bespoke and all food is made in front of you to order. when the smell of freshly cooking bacon and espresso coffee is hard to ignore. 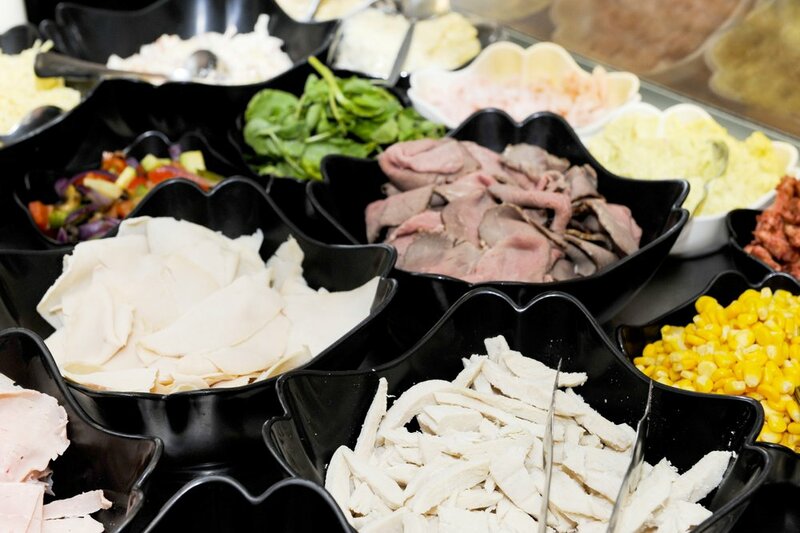 We have a huge selection of sandwich fillings which are made by ourselves on site. All are available on sliced or crusty bread, baps, baguettes or wraps. We also offer alternatives such as jacket potatoes, salad boxes, wraps and hot grilled paninis. We also stock Gluten free bread and cater for vegans too. We now provide gluten free bread which you can order with a range of our fillings and if you fancy something sweet, we have a selection of cakes too. We can cater for most dietary requirements in shop and for our buffet menus, just ask! Why not call us in the morning and pre order your lunch then simply pop in at lunch time to pay and collect. Just make sure you call before 11am to give us plenty of time to prepare your order.